In an interview with George Stephanopoulos, John McCain managed to say nothing in 140 characters or less. Yesterday we witnessed the final demise of political journalism. A TV news talk show host who used to be a political operative interviewed a former presidential candidate on important subjects such as foreign policy and the economy, in a format that required all answers be rendered in 140 characters or less. It was billed as a "Twitterview," conducted by George Stephanopoulus, with John McCain as the hapless interviewee typing out such bons mots as "hi george im a little slow". McCain recently began Twittering, which is to say, typing out short and banal descriptions of whatever flatulence happens to enter his brain and posting it on a Web page. For journalists and politicians, and for McCain in particular, Twittering has been an embarrassing exercise in the flogging of useless new media fads. 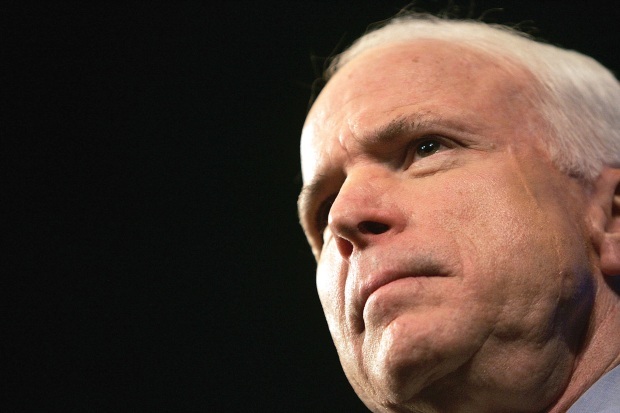 GStephanopoulos@SenJohnMcCain What worries you more: Pakistan or Iran? SenJohnMcCain@GStephanopoulos both. the challenges are different but both significant. Well, that clears up that pressing little geopolitical issue! John McCain has obviously gotten the message that he needs to be a little more tech-savvy and learn about new technology. And George Stephanopoulos has obviously gotten the message that the coveted twentysomething demographic that news outlets have been losing for a generation enjoy using Twitter. But to attempt to use Twitter for a genuine policy discussion is just a dumb, unreadable stunt.